*We will provide a much more detailed guide on how to defeat the boss once the English version of the game comes out. 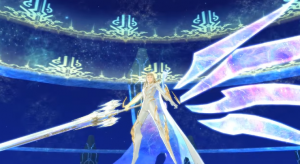 This boss guide will show you how to beat Artorius, the final boss for Tales of Berseria. The boss can be found on the last dungeon that Velvet Crowe and her party members will reach during the end of the game. Velvet Crowe’s “Muritsihahan”, one of the last Artes that she will learn in the game, is very effective against the final boss. Use this attack wisely, avoid his barrage of attacks first before striking. The key to defeating him is to counter his every move. Since he has very powerful attacks, it is best to dodge them instead of blocking them.